I saw this cute idea at a baby shower and tried it out this week. I love that it can be used over and over, or given to Mom for décor in baby’s room. I’ve seen these made with really long strips, really short strips, all pushed together with no rope showing…you get the idea. There are lots of possibilities to play with. 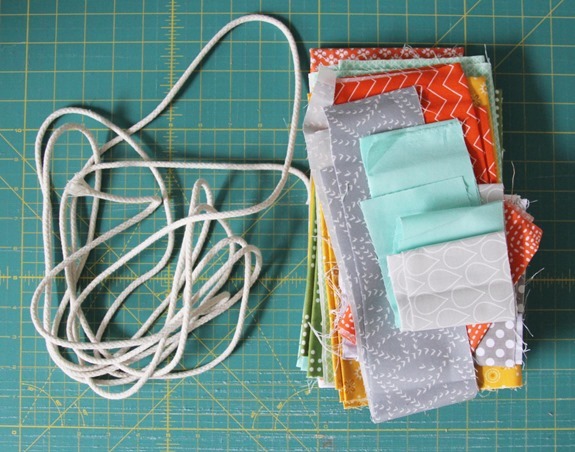 You need rope/twine/string as long as you want it, and fabric. Cut a strip about 3” x 16” …I didn’t cut on the bias but you can if you want to avoid fraying. 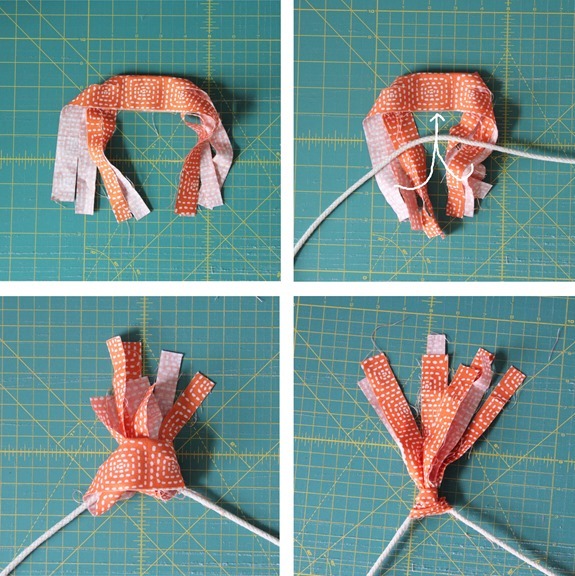 Fold in half and cut the ends of the strip into smaller strips…you can eyeball this. Make sure not to cut all the way through the middle. Leave about 1” to 1 1/2” uncut in the center. 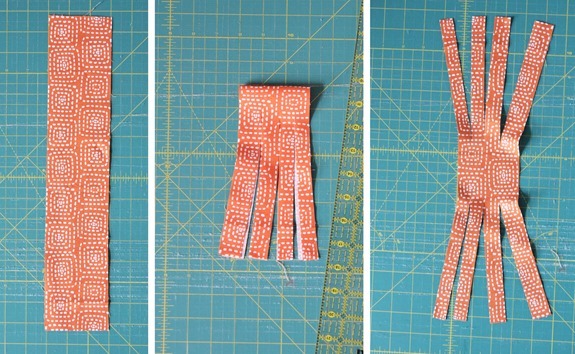 Fold the strip in half matching the center raw edges (no need to be perfect! 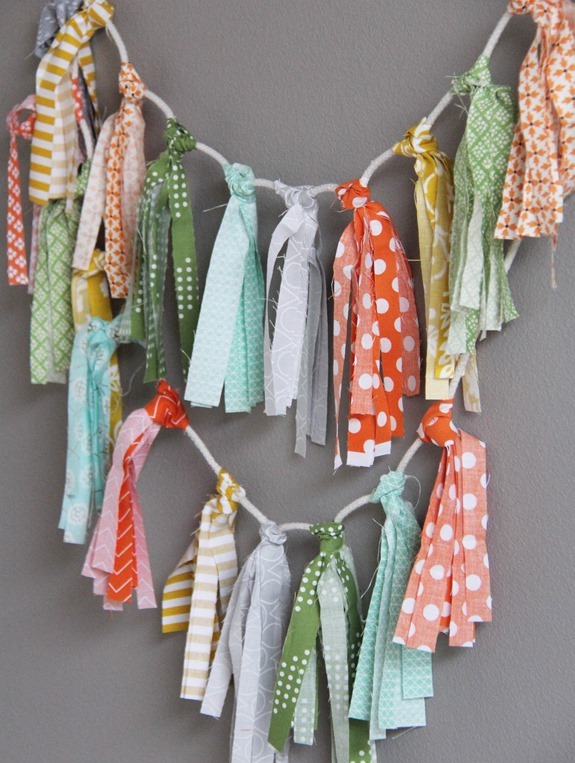 ), place the rope on top, and pull all the little tassels up over the rope and under/through the center portion. If that doesn’t make any sense hopefully the pictures will…your basically just making a pretty knot. Then make lots more! You can stack and cut them with a rotary cutter to make it really fast. I place them loosely on my rope where I want them, then I go back and tightened them up. 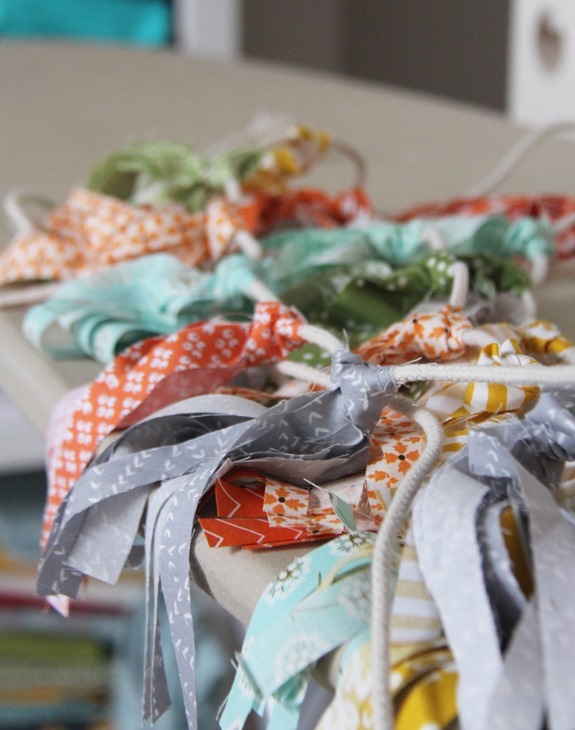 Avoid handling them too much or you’ll get lots of strings and fraying….you can cut strips on the bias to avoid it. Done! You can snip the ends and rotate the little knots and tassels around as you like. My scrap obsessed/hanging things in her room obsessed 5 year old would love this. Yay for a project we can do on a rainy day today. Great idea! So easy! So fun! So pretty! And the first ACTUAL stash buster I've actually ever seen! Very clever idea and so pretty. Thanks for the tutorial. 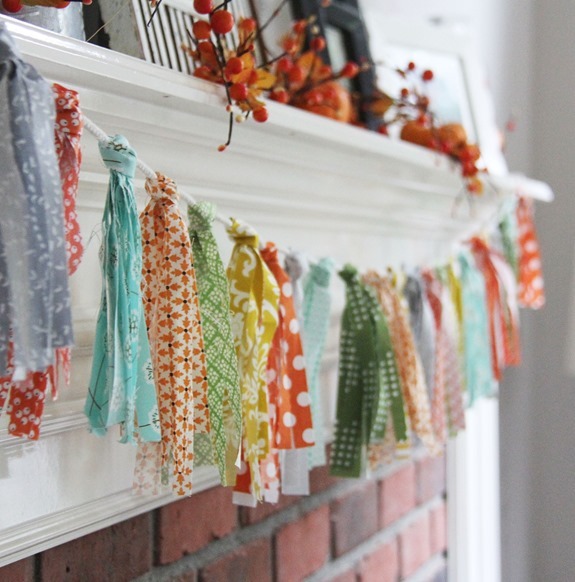 This garland is really cute. I would not have thought to make this way. Thanks for sharing. 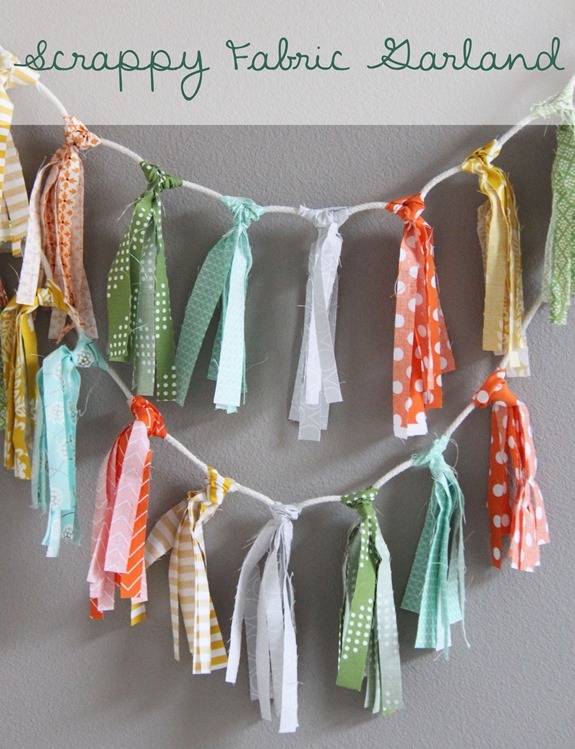 What a great idea, maybe with Christmas scraps even! Anything that can be done in minutes and on the go, is my kind of project! Thanks for sharing! This would be great done in batiks because of the color saturation. Thanks for sharing! Beautiful! Thanks for haring! i see some garlants here pretty soon! I LOVE this idea! This may be how I decorate my house for Christmas! I could totally see this being put on/over white Christmas lights hung around the top of the wall to make it a bit more festive! Thanks for the lovely idea! Similar fabric garlands decorated a wedding I attended in late summer. I collected the strips and have nearly finished an improv quilt made from all the strips, to give as a gift to the bride and groom.